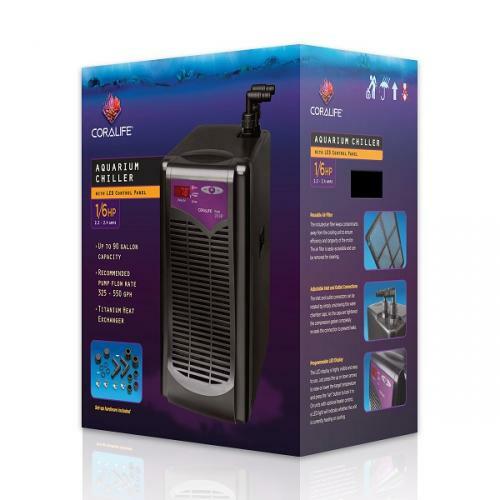 The Coralife Aquarium Chiller provides accurate temperature control with the quality construction and durability you have come to expect. Reusable Air Filter	The inlcuded air filter keeps contaminants away from the cooling unit to ensure efficiency and longevity of the motor. The air filter is easily accessible and can be removed for cleaning. Adjustable Inlet and Outlet Connections	The inlet and outlet connectors can be rotated by simply unscrewing the water chamber caps. As the caps are tightened the compression gasket completely re-seals the connection to prevent leaks. Programmable LED Display	The LED display is highly visible and easy to use. Just press the up or down arrows to raise or lower the target temperature and press the "set" button to lock it in. On units with optional heater control, a LED light will indicate whether the unit is currently heating or cooling. Does not have a pump. The required flow through the chiller is between 325 gph and 550 gph. 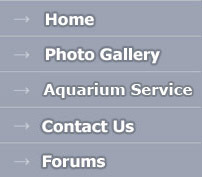 Maximum Tank Size: 90 gallons. If your tank is in a room that is at times over 82 degrees, or if you need to reduce the temperature more than 10 degrees, you should consider a larger chiller. Length 19.50", Width 16.25", Height 18.25"